Hi guys! 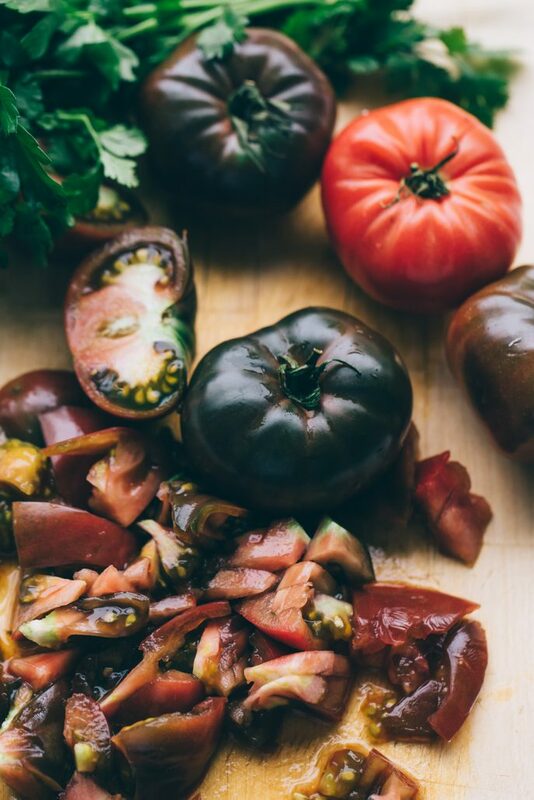 It’s Gab from Artful Desperado with a super tasty recipe for a Salmon with Mole Inspired Rub, the latter also known as one of my favorite Mexican mother sauces. Now, there are many kinds of mole, not just the dark brown one that has chocolate in it. There’s green, yellow, sweet, spicy, herby, you name it! The most famous one is mole oaxaqueño, which is the one with sweet, smokey, spicy notes. 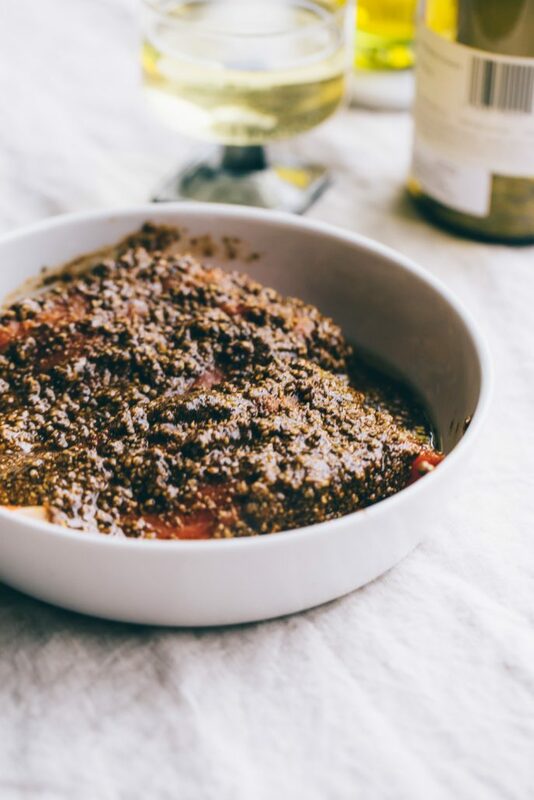 Now, the original recipe for this mole has some twenty-something ingredients, which is a bit too intense to cook, but, for this Salmon with Mole Inspired Rub, I combined some of the ingredients to make it similar and way less labor intensive. To cool things down a bit I am serving this salmon on a bed of Israeli couscous, which is like regular couscous but bigger. I love how hearty it is! 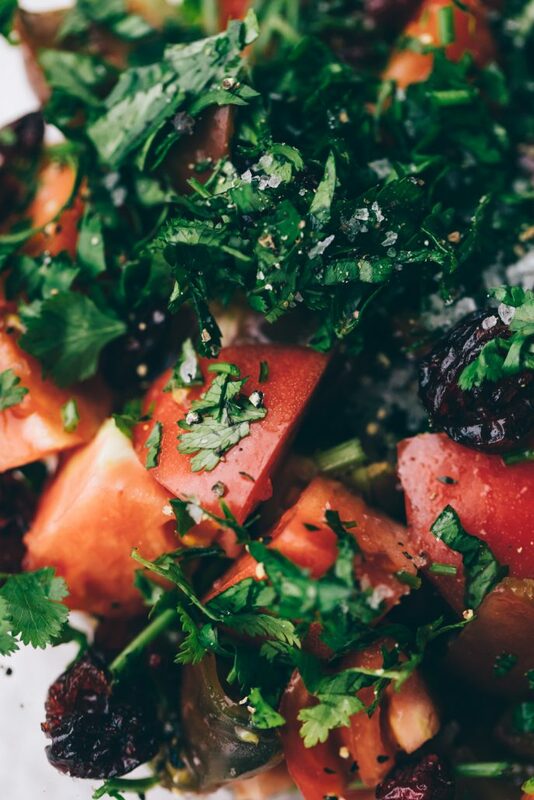 Adding a ton of fresh herbs and tomatoes takes it to the next level. For wine, since we are mixing spicy with fresh, I think a nice glass of Chardonnay would keep things even. 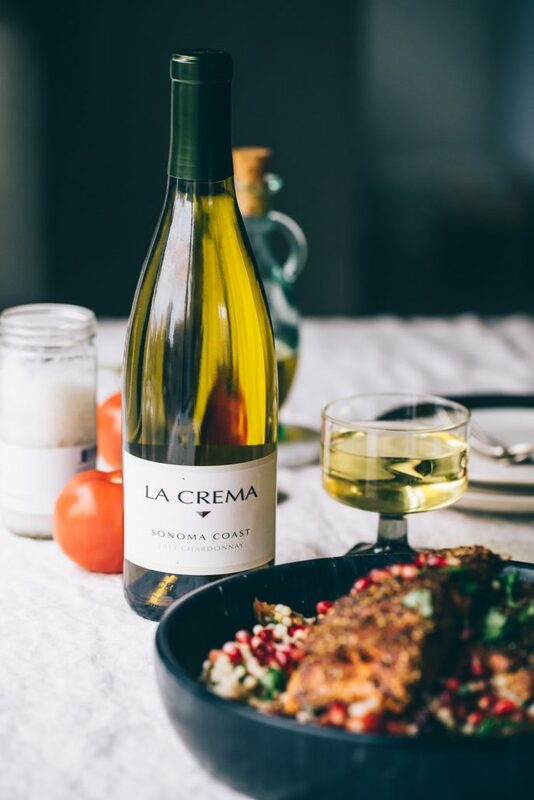 The wine I selected for this pairing is La Crema’s Sonoma Coast Chardonnay. 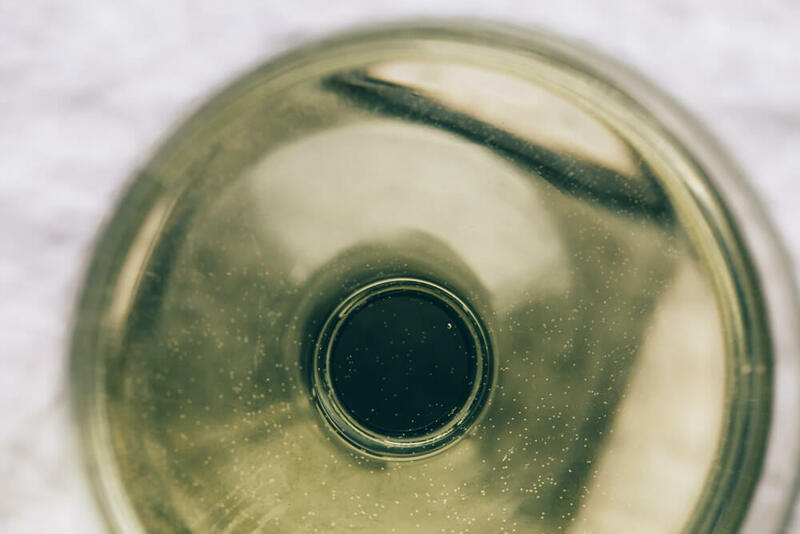 With lovely citrus notes that obviously pair really well with the fish, it’s nice smooth fruity finish helps echo the flavors in the protein alongside the hearty couscous. Oh and by the way, you can find the ground chiles in almost any Mexican specialty store. 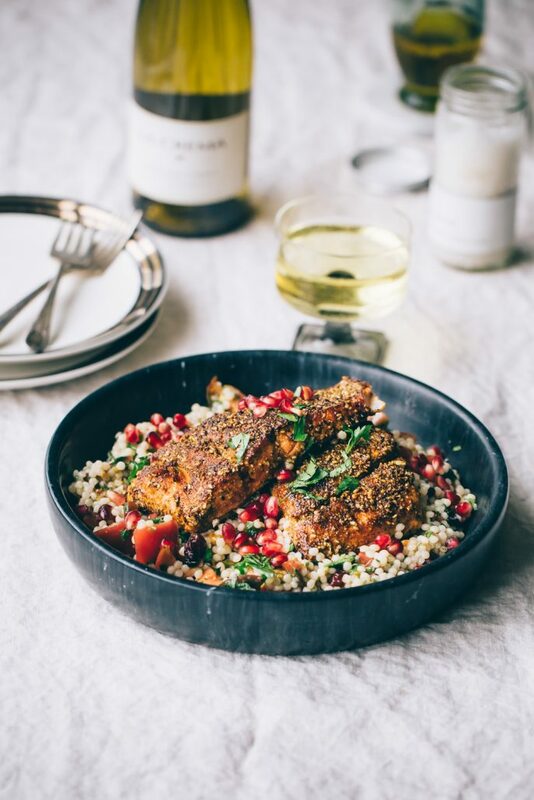 Enjoy a spicy yet fresh twist on a favorite fish with this Salmon with Mole Inspired Rub and Fresh Herb Israeli Couscous, paired with Chardonnay. Start with the rub: place all the ingredients in a food processor or blender and blend until smooth – 2 to 3 minutes in high speed. Pour the rub over the salmon fillets and let it sit in there for 5 minutes. Remove excess rub, heat up a pan with oil and bring it to smoking point, then, flesh side down, fry the fish for 3-4 minutes until it forms a crust. Keep an eye on it as it can burn easily! Flip the fish and let it cook for another 2 -3 minutes and remove from heat (if you like your fish completely cooked, leave it for longer). Place the stock in a pot and bring it to a boil, then add the couscous and let it simmer on low heat for 8-10 minutes until cooked through. Remove from the heat and drain for a couple minutes. Once it has cooled down a bit, place it in a bowl and break it apart gently with a fork. Add the rest of the herbs and seasoning and toss to combine. 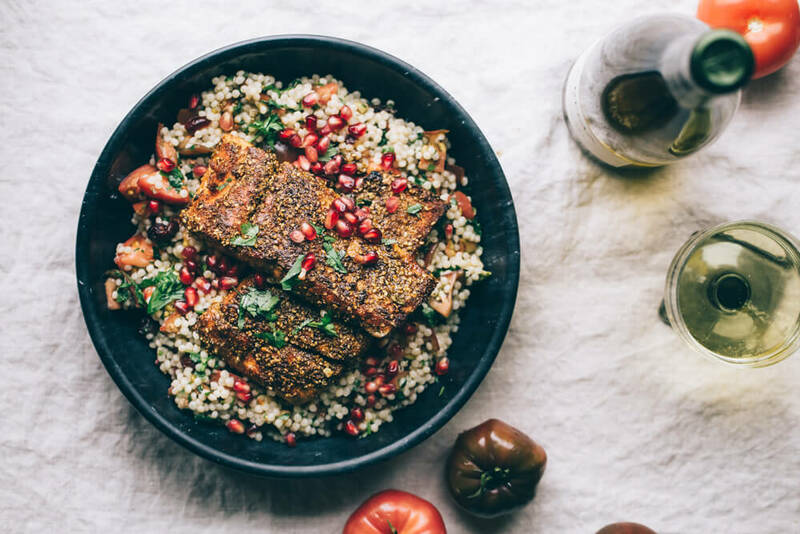 Place the couscous on a large platter, then top with the salmon, and garnish with more fresh herbs and some pomegranate if you have some at hand. So pretty! Yes? And super tasty. Hope you enjoy this recipe!